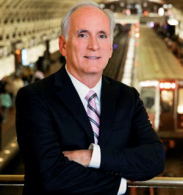 Known globally for its iconic station architecture and high-quality service for millions of residents and visitors to the nation’s capital each year, its reputation as one of the premier American rail systems declined dramatically over the last decade. Deferred maintenance, a lack of a dedicated funding, a complex governance structure and other factors resulted in a crisis of credibility to provide a safe, reliable and financially sustainable rail system. AICP Certification Maintenance credits are pending for this event.